Szu-Wei Ho is an artist from Taiwan and currently lives in Brooklyn, New York. Influenced by literature, especially children's literature, and her home, Taiwan, she transforms what she perceives and remembers into various characters who live in their own world. That world is full of fun, playfulness, but also dark and strange. Animals, plants and marine lives appear in her imagery, but always have a little bit of illogical metamorphosis. Being narrative and illustrative is not meant to restrict the viewer from their own interpretation, but to welcome a wilder story not yet finished. 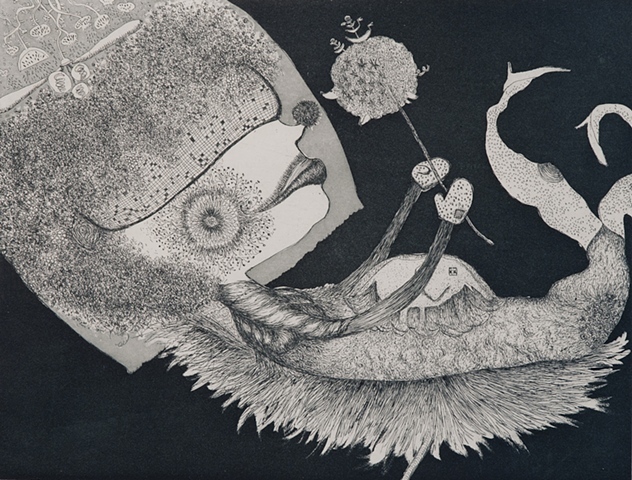 She is using printmaking, or etching, to be more specific, as the major medium of creation. Currently she is also exploring artist books and small sculptural work, hoping to have an installation somewhere, someday.